Set in 1810, this exciting story is rich in history of the Napoleonic era and the smugglers that made Rye, England famous. It’s also the story of Tess Leighton, impoverished by her father’s debts, who becomes the leader of the Rye smugglers to feed the people and take care of her ancestral home, which is falling down around her. By night, she runs a dangerous game, one step ahead of the government agents who seek the death of the one called “the Romney Fox”, a smuggler whose calling card is a black rose. In her sleep Tess suffers nightmares from the time her father locked her in the cellars and spiders crawled over her. After crucial military secrets are discovered being sent to Napoleon, London Viscount Ravenhurst, a hero of Trafalgar, is dispatched to catch the spy. Ravenhurst and Tess have a history: once they were in love. Each felt betrayed by the other and now they are enemies. Worse, he believes she is involved in sending English gold to France, prolonging the war. But neither can deny the passion that still sizzles between them. He takes her innocence when she is drugged but vows to wed her. She will have nothing to do with him. Then Tess is betrayed and finds herself the captive of Andre Le Brix, a notorious smuggler pirate, who would claim her as his own. In his arms, she finds the love and peace she seeks. A very exciting, well-written story of the adventure swirling around the beautiful Tess. Yes, it’s a bodice ripper and I promise it will keep you turning pages. Great dialog, wonderful characters, a very courageous heroine. What’s not to love? It’s a keeper. 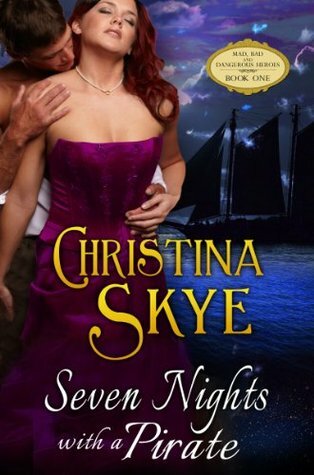 Note: I understand the author has revised and re-released this as Seven Nights with a Pirate. Some reviews say it’s not as good as the original, which is the one I read. I cannot judge the new one, but I loved this original.